Twin sisters Carolyn and Celeste Warren remember much of their childhood in homeless shelters. Friends or extended family members would take them in briefly; sometimes on their own or with their mother. Their parents used drugs and alcohol and, at times, ended up in jail, leaving the girls to take care of themselves and other family members. When Celeste was 18, her friend who lived at Pathways suggested she live there too. Pathways is Center for Human Services’ transitional living program in Modesto that provides apartments at no cost for homeless 18-24 year olds. At the time, Carolyn was living with a boyfriend, but joined Celeste at Pathways when she was 20. Each Pathways resident is required to follow rules to stay there for up to 24 months, including chores, getting a job, and saving $3,000 for housing after they complete the Pathways program. The residents also work with Pathways mentors to establish goals to accomplish during their time there. The sisters’ goals included getting their driver licenses and cars and paying off credit card bills. Both completed their goals in just months. “Pathways is a place where you literally grow and become independent,” Carolyn said. “It trained me to to think five steps ahead now, that there’s consequences to what I do. In addition to life skills, Carolyn and Celeste are grateful for the relationships they built with Pathways staff. 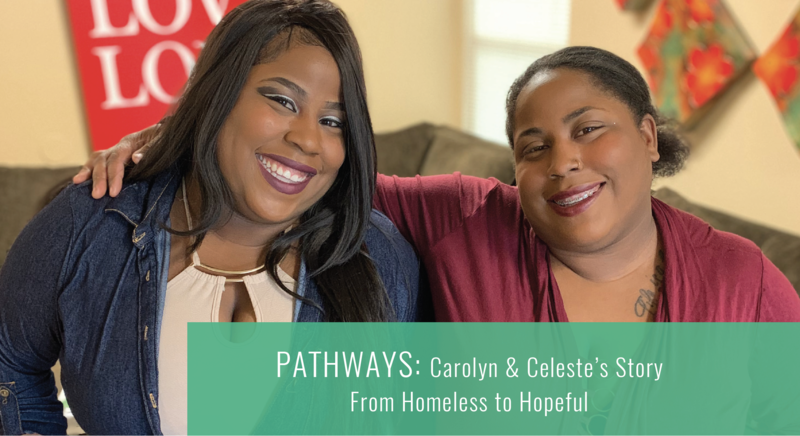 Since graduating from Pathways, both Carolyn and Celeste live in apartments in Modesto, continue to work, and plan to finish their college education. Now at 24 years old, Celeste wants to become a police officer and Carolyn aspires to work at Pathways one day to serve as a guide and give hope to young adults who are like she once was.